The purpose of this blog is to write a posting on the progress of Tess's pregnancy and how she is coping. It is not intended to offer clinical or veterinary advice. With all puppies now settled into their new homes and our own pup settling in with her own pack. The time has come to think about puppy classes. I am also planning to show her so we will be looking at Ringcraft classes. Lily nearly 15 weeks old is a delight, though I say so myself, we have all noticed that she is friendly with other dogs, children and adults alike, she appears to be very well socialised. She loves a run around with her mum and grandma. We are looking forward to taking her out and about next week Lily will probably have sensory overload when she visits the forest - all those woody smells. She will no doubt need a bath, but this won't be her first bath. Next week we plan to take her to see the sea and hopefully she will have a little paddle. So lots of fun times ahead for all .. .. .. .. . 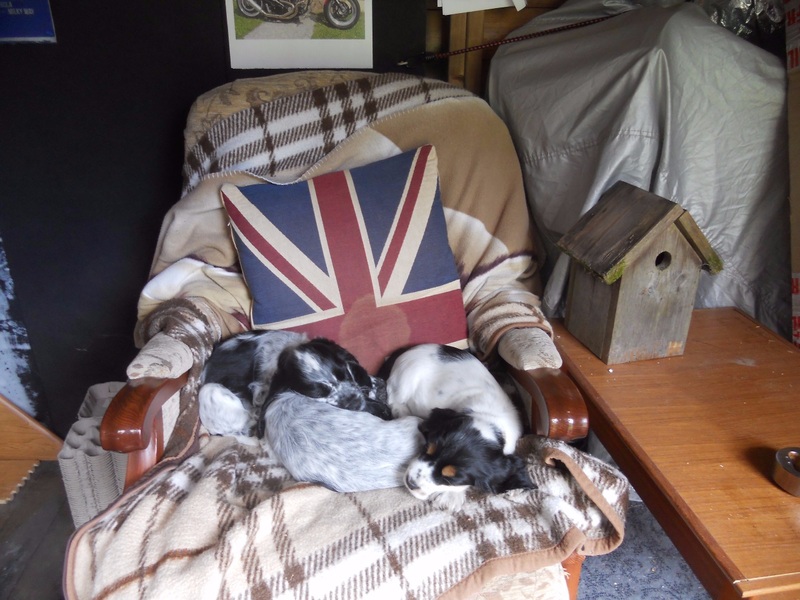 The pups this week have found their way into the man shed! Yes even these little beauties could turn nasty in the wrong hands. Oh! how my family laughed when I told them I was going on a Canine Communication course the over evening. Its easy to speak dog, Woof, Grrr. Yep they took the mick, what is mum getting up to now! Over the past couple of years I have attended several courses run by Natalie Light that include first aide for dogs and a Life Skills for Puppies course. Of course I'm no expert but there is always something to learning. I couldn't begin to delve into every detail of the Canine Communication course but there were a few things that I thought I would share that involve safe behaviour. If you have children then it may be worth discussing the following with them. 1. Ask permission from the dogs owner before you stroke the dog. 2. Give the dog the choice to come to greet you. 3. Do not crowd the dog or get in their space, this includes hands reaching forward. 4. Never touch a dog that is sleeping or eating. 5. Avoid staring directly at the dog. Then again for the owner; keep your dog safe by managing interactions, observe and listen to your dog, react calmly, effectively and appropriately and never punish your dog (in otherwords dogs learn through praise and reward). Natalie herself is a member of the Association of Pet Behaviour Counsillors (APBC) and is a registered Clinical Animal Behaviourist this makes her a member of the Animal Behaviourist Traning Council (ABTC). Interestingly though Natalie discusses that when it comes to training anyone can set themselves up as a trainer. She herself is very well qualified and suggests that to avoid any potential future problems, that could be in part be brought on by an unqualified although well meaning trainer, that it is in the dogs best interest to find a trainer that is qualified. So it is advisable to look out for the letters above in brackets when looking for a trainer for your dog. Things are getting quieter round here what with Ruby off to her new home last Tuesday and Bailey gone today. 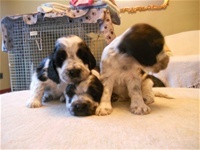 What a shame the weather has turned, its a bit too cold and moist for the puppies to venture out today. But the puppies had a rare old time yesterday, exploring the garden and the grass which is a bit long. The grass must appear like an adventure forest playground. Would you like to know the daily routine? 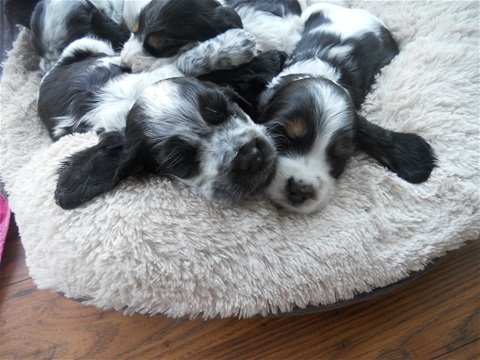 The puppies wake around 6.30 - 6.45 - they may be awake a bit before then, but that is the time I hear their little barks. When I come downstairs - Tess and Georgie are still asleep. 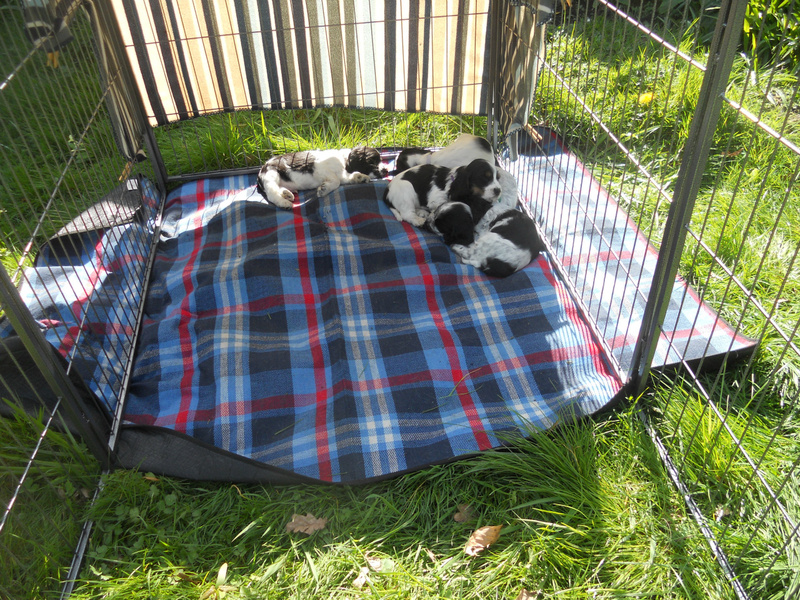 The puppies though need a quick clean out first and formost, so they are contained in their bed (the whelping box). The floor is cleaned and disinfected and fresh newspaper and training pads are put down. Then the puppies are fed. The puppies are hungry, first meal in 12 hours, every crumb is eaten. They have a short play, at around 7.45 - 8am they go back to sleep. All that growing they need plenty of sleep. Tess and Georgie have access to the garden and they have their breakfast, usually Al fresco, unless its raining. When my husband comes downstairs he is on puppy watch duty. Tess and Georgie have their walk. 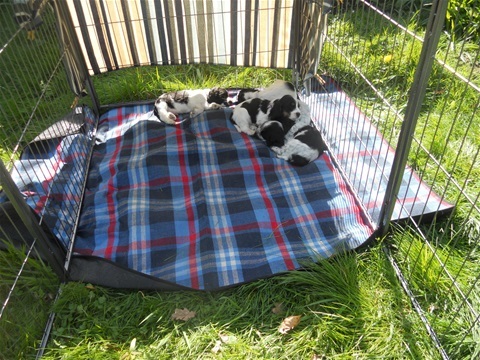 By the time we come back the puppies are usually awake - they have a nice long play and are either outside in the puppy pen, having supervised access to the garden or patio or if its a day like today they will be contained in the dog room. At 10.50ish they have breakfast number two, another play then another sleep. They are following a pattern, because after they have had more play and food then they sleep again. The afternoon is the time that they are usually awake for the longest time, enjoing a nice long play. At 3pm they have meal number 3, their mosit kibble. When they have finished their moistened kibble I put down some dry kibble - they enjoy a good crunch and its good for their teeth. During the afternoon they have a brush over with a baby brush. They always have access to a bowl of water. At 5pm they go back into the puppy pen in the kitchen. This is where their bed is. They are usually quite noisey when they go back into the puppy pen, protesting I think about being put back to bed. But it isn't long before they fall asleep. They sleep through all the cooking and household noises - they are familiar with everyday sounds now, they are not concerned with all the comings and goings, the cat, doors opening closing and the sound of the TV. They sleep quite well but wake up around 6.30 -7pm when they have a short play more kibble - although at this mealtime they tend now not to eat all the kibble - then they sleep - right through until the next morning. Probably by the time the puppies go to their new homes they may be satisfied with three meals a day - it depends I think. With the puppy that we are keeping I will stop the 11 am meal and bring the 3pm meal forward to 1pm. Today Tuesday they have had their toe nails and fur around their paws trimmed. 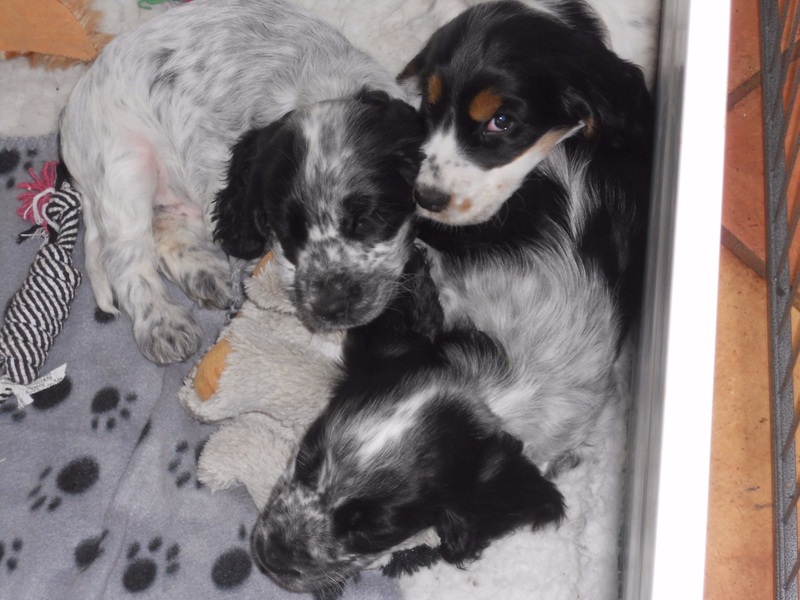 They have this done on a weekly basis - it may seem that it isn't needed, but its important that the puppies get used to having their paws examined and handled. It takes just a few minutes but an important part of their socialisation. Next Tuesday though it micro chip, 1st vaccination and vet check day!